What are High Court Authentications? Before South African documents can legally be used abroad, they have to be properly authenticated. The country to which you are traveling to will determine the authentication process that has to be followed. Authentication can be simplified if the country you are traveling to is a member of the Hague Convention, but where the country does not form part of the Convention, a Certificate of Authentication by the High Court will often be required. Rule 63 of The Rules of the High Court of South Africa regulates the requirements for authentication where documents are executed within South Africa for use abroad. A Notary Public Seal in South Africa, clear and embossed. Whenever a country does not form part of the Hague Convention, South African documents will have to be signed and/or executed in the presence of a Notary Public (see our Notarisation services). The Notary Public will then attach a Certificate of Authentication to that signed document that also bears the Notary’s signature, stamp, and seal. How do I apostille a notarisation or High Court Authentication? 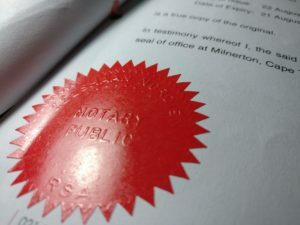 After the document has been signed, stamped, and sealed by the Notary Public, it can be forwarded by the Notary Public to the High Court in the Notary’s area of practice. The High Court will then attach an Apostille Certificate, which serves to confirm the Notary Public’s signature. Apart from authentication been done by the High Court, documents could instead be required to be submitted to the Legalisation Section at the Department of International Relations and Cooperation (DIRCO). Once at the DIRCO offices in Pretoria, the document will be submitted for final legalisation for use outside of the Republic of South Africa. In terms of Rule 63 of the High Court, any contract, power of attorney, affidavit, or another document, must have its signature verified by a recognized Government authority. Rule 63 prescribes that only certain documents may be authenticated using the process provided therein. Can I use a High Court Authentication in Lesotho, Botswana or Swaziland? In terms of Rule 63 of the High Court, there is one exception: where a power of authority is executed in Lesotho, Botswana, or Swaziland and is intended to give authority to any person to take, defend, or intervene in any legal proceedings in a South African Magistrate’s Court, such power of authority need not be authenticated in terms of the abovementioned process, provided it has been signed and attested by two competent witnesses. Can you handle my High Court authentication and apostille? As you can see, the process of getting an official South African document authenticated by the High Court is a complex procedure. Let us get your documents signed by a Notary Public who verifies the document and then we can facilitate a speedy High Court for authentication.